Xtrema Ceramic Cookware is the healthiest alternative we have found to the toxic non-stick coating found in most cookware. An excellent option for those concerned with nickle in stainless steel. * 10” Diameter: Perfect for cooking multiple servings and ingredient-heavy dishes. * 3.5 lbs: Easy to handle with rugged durability for everyday use. * Cool-to-the-Touch Handle: Designed for ultimate comfort during transfer. * High-gloss Finish: Featuring a non-toxic ceramic glaze with high-gloss, scratch-proof black finish. * Dishwasher and Microwaveable Safe: For the most convenient cooking experience. Our 10” skillet is functionality meets beauty at its best. With a cushiony and protective silicone handle designed to stay cool for easy transfer and ample cooking surface for your everyday meals or wow-them special occasions, you’ll soon discover how important this skillet is to your kitchen. The unique construction utilizes radiant heat so you enjoy food that is cooked perfectly, from the deep middle to the outside. 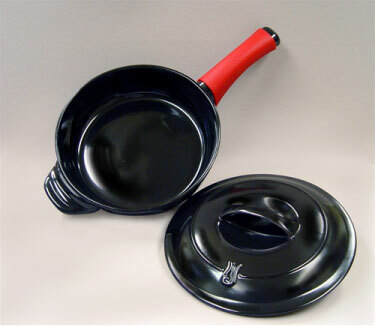 Unlike other skillets that either use non-stick coatings or emit toxic fumes or leach taste-altering metals into your food, your new 10” skillet ensures your food tastes exactly as it should. You’ll be surprised – and pleased! – by how much more flavorful your dishes are. This skillet is celebrated for its ease-of-use. With a silicon-protected handle, transferring from stovetop to tabletop is a cinch. Thanks to its revolutionary design, you can take your skillet straight from the burner to the dining table to the fridge. Cooking a spinach frittata and need to pop it in the oven for the eggs to set? No problem! These skillets work as well in the oven as they do on the stovetop. Have to run out quickly after dinner? No problem! Just stick the skillet in the fridge, a wonderful storage solution. Thanks to its no-scratch surface and dishwasher-safe construction, clean up is a breeze. With a few scrubs of the scouring pad or a run through the dishwasher, your skillet is like brand new, ready for your next culinary masterpiece. * Non-scratch: You have the freedom to use any utensils: nylon, silicone and wooden. * Versatile: Built to withstand extreme heat and cold, each piece can go directly from oven to freezer. Whether you want to cook on the stovetop, broiler, grill or microwave, you can do it all with Xtrema. * Easy to Clean: Spend more time enjoying your food and less time cleaning up after it with Xtrema’s sinfully easy clean up … you can even stick it in the dishwasher! * Practical: With Xtrema, your cooking time is reduced and your food will stay hotter longer. * Healthy: Your food will not only taste better, it will be healthier as no trace metals or chemicals leach from the non-toxic ceramic glaze surface. * 100% Green: Not only is cooking with Xtrema healthy for your family, it’s also friendly to the environment. From the earthy-friendly production practices and inorganic natural minerals used in construction to the safe ceramic glaze alternative to harmful PFOA coatings of most other popular non-stick cookware, Xtrema is eco-friendly. * Handcrafted: Each piece is handcrafted to uphold the strict quality standards of the world’s finest ceramic cookware.